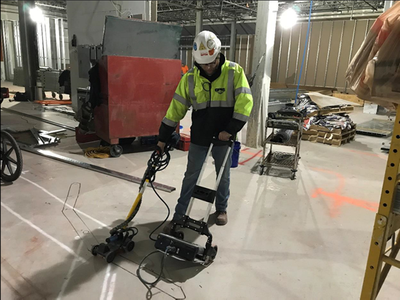 Ground Penetrating Radar Systems was recently called by a local contractor to scan an existing space that was being renovated in Beaver Creek, Ohio. The contractor needed to saw cut the concrete slab in multiple areas to install new plumbing and electrical conduits. The space had been renovated, and there were no drawings that showed what utilities existed under or within the slab. Striking a conduit or shallow utility when saw cutting can be expensive to repair and dangerous for the contractors on site. 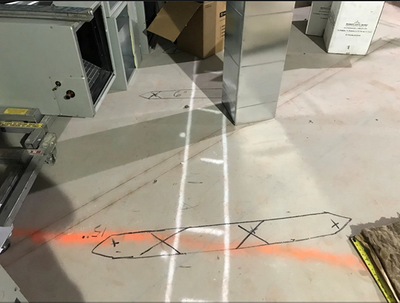 GPRS was called to mark out any conduits or shallow utilities so the contractors could saw cut the slab without damaging any existing utilities. GPRS located several conduits or shallow utilities within the saw cutting areas. Some of these conduits were very shallow and could have been struck during saw cutting if they were not identified. GPRS was able to get to the job in a timely matter so the project could remain on schedule. 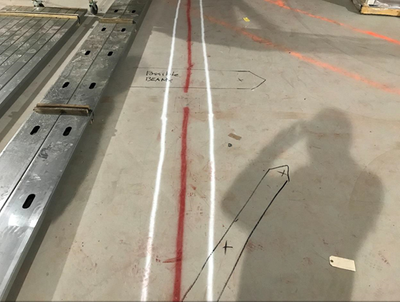 Ground penetrating radar is an accurate and effective way of locating conduits, rebar, and post tension cables in a concrete slab. For more formation on how GPRS, LLC. can help you on your next project, please contact Jared Malone at (937) 604-7802 or by email at jared.malone@gprsinc.com. We also have the capabilities of locating underground utilities, underground storage tanks, and voids.